Looking for an 8-inch tablet that takes and makes calls and also lets you take notes at the same time? Then you can't beat Multi Window on the GALAXY Note 8.0. There are loads of reasons you should check out the new Samsung GALAXY Note 8.0, not least because it comes with a cutting edge S Pen, a large and expansive WXGA display and a neat form factor. But it can also supercharge your life in a number of other ways, such as allowing easy task management on the go with the unique Multi Window feature; read on to see how easy it is to get the most of the cutting-edge tablet. One of the tricky things on most tablets is making sure that you can actually make use of the cutting-edge features on offer, with multiple key presses the name of the game to do the most facile of tasks. With the Note 8.0 all you need to do is hold the back key and you'll have instant access to the portal of Multi Window apps, which you can drag and drop into the main windows as you like to give instant access to more information and entertainment. One of the main reasons we all need to multitask from time to time is to be able to send information from one app to another. On some smartphones this involves a convoluted process of opening an app, closing it down then copying the information to another one. 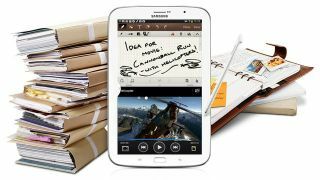 With S Note and Multi Window, you can open a plethora of apps, be it email, the internet or a chat pop-up, and using the advanced S Pen copy the information down using your own handwriting without needing to open and shut different programs. What if you need to change the way things are running on the GALAXY Note 8.0 on the go? Say you've got your chat window open and you're idly browsing around Google Maps – and your friend sends you a funny picture to look at? You don't need to worry about moving the divider up and down to see it; just hit the switch window tab and the two apps will swap sizes seamlessly so you can see what's being sent instantly. Mapping on the move is one of the best things you can do on the Samsung GALAXY Note 8.0, as the large screen makes it easy to see where you've been or where you're going. But if you need to check directions, be it from the internet browser or an email, you can have both open at once meaning it's simple to see where you're going and verify it's the right place. And if you use the S Pen's Easy Clip function, you can even drag and drop a picture of the destination right into the messaging window to show chums where to go! We've all been there, waiting for that pivotal email to come along so you can respond right away. But instead of sitting there waiting for the missive to land, you can use Multi Window to chat with friends, play a whole host of games or just flick through the internet instead of jabbing at the refresh button. And don't forget you can do this in landscape or portrait, giving you the space to move through your messages when you need to. With Multi Window, the choice is yours over how you use it. So if it's a case of not wanting to have the whole email application open, just drag the central bar and you can make either app bigger, making it easier to browse the web while you wait for the boss to respond to the report you just sent – or get the confirmation on where you're meeting for dinner tonight.